Archives & Access, funded by the Heritage Lottery Fund (HLF) and Tate, has been a five-year programme of digital access, participation and learning with archives, featuring new initiatives and activities at Tate Britain, on the Tate website and with partners across the UK. Tate Archive is the world’s largest archive of British art. 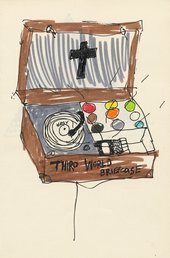 It contains a rich array of artists’ materials, including photographs, sketchbooks, diaries, letters and objects, documenting the lives and working processes of British born and émigré artists from more than 900 archive collections. As a result of Archives & Access, over 52,000 pieces have been published online. The project also produced a suite of digital tools and resources that support discovery of the digitised collections. These include: the Albums feature, which allows users to collate and share collection pieces published on our website; Animating the Archives film series, which explores artists and themes inherent in the collections, and; AnnoTate, an online crowdsourcing transcription tool that invites audiences to transcribe text from the collections. A vitally important part of Archives & Access has been to foster engagement with new audiences via programmed participation, developed in conjunction with large scale publication. 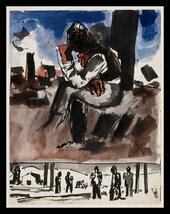 This has seen Tate partnering with five UK institutions – Josef Herman Art Foundation Cymru, Tate Liverpool, Tyne and Wear Archives and Museums, Turner Contemporary, Margate and Tate Collective - to explore how people across the country can learn through archives. This programme has facilitated creative workshops, engagements with project artists, exhibitions, community events for school groups, young people and adult participants, and research and practice sharing activities for stakeholders, all developed to connect audiences with local and national art, artists and heritage. Archives & Access also initiated a two-strand volunteering programme at Tate Britain, which engages a highly diverse range of participants of all ages and experience with archive collections. Finally, the Archives & Access project included the creation of six new dedicated learning and public Archive Gallery spaces at Tate Britain, providing visitors to Tate Britain with additional means of encountering Tate Archive collections. The Archives & Access project concludes in September 2017. Looking ahead, archive digitisation and outreach will continue at Tate; the project becomes a programme. Archives & Access forms part of The Millbank Project, a multi-stage transformation of Tate Britain that embodies Tate’s commitment to providing a cultural experience appropriate to a world class museum.